Osteoporosis is a common disease in later life, which has become a growing public health problem. This degenerative bone disease primarily affects postmenopausal women, but also men may suffer from reduced bone mineral density. The development of prophylactic treatments and medications of osteoporosis has become an urgent issue due to the increasing proportion of the elderly in the population. Apart from medical/hormonal treatments, current strategies for prophylaxis of osteoporosis are primarily based on calcium supplementation as a main constituent of bone hydroxyapatite mineral. Despite previous reports suggesting an essential role in skeletal growth and development, the significance of the trace element silicon in human bone formation has attracted major scientific interest only rather recently. 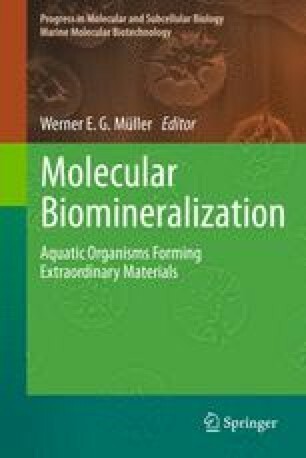 The interest in silicon has been further increased by the latest discoveries in the field of biosilicification, the formation of the inorganic silica skeleton of the oldest still extant animals on Earth, the sponges, which revealed new insights in the biological function of this element. Sponges make use of silicon to build up their inorganic skeleton which consists of biogenously formed polymeric silica (biosilica). The formation of biosilica is mediated by specific enzymes, silicateins, which have been isolated, characterized, and expressed in a recombinant way. Epidemiological studies revealed that dietary silicon reduces the risk of osteoporosis and other bone diseases. Recent results allowed for the first time to understand the molecular mechanism underlying the protective effect of silicic acid/biosilica against osteoporosis. Biosilica was shown to modulate the ratio of expression of two cytokines involved in bone formation–RANKL and osteoprotegerin. Hence, biosilica has been proposed to have a potential in prophylaxis and therapy of osteoporosis and related bone diseases. This work was supported by grants from the Bundesministerium für Bildung und Forschung (project “Center of Excellence BIOTECmarin”), the Deutsche Forschungsgemeinschaft (Schr 277/10-1), the European Commission (no PITN-GA-2008-215507 – BIOMINTEC), the BiomaTiCS consortium of the Mainz University Medical Center, the Johannes Gutenberg University Research Center for Complex Matter (COMATT), and the International S & T Cooperation Program of China (Grant No. 2008DFA00980). W.E.G.M. is a holder of an ERC Advanced Grant (no 268476 BIOSILICA).